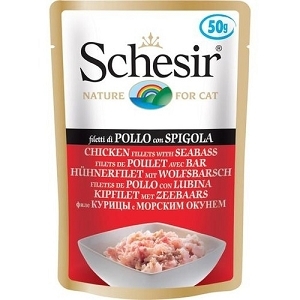 Schesir Fruit Dinners are a newly introduced range of nutritious complimentary food for cats, with six distinctive flavours each containing different fruits. 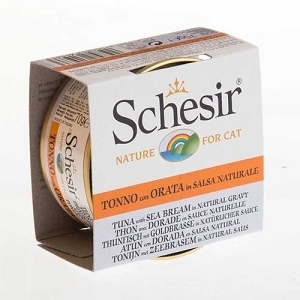 Schesir distinguishes itself not only through the appetising taste of its selected ingredients but also through providing a healthy and well-balanced diet. Apples are low in protein and fat and contain plenty of pectin, vitamin B and bioflavonoides, which have an anti-ageing effect. Pineapple has an anti-inflammatory effect, thanks to the enzyme bromelin. Papaya is rich in antioxidant vitamins and minerals. It also contains a special enzyme which facilitates digestion of protein. 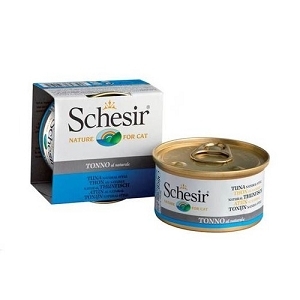 Produced using sophisticated techniques under strict controls in order to produce the highest quality products and exceptionally appetising food. 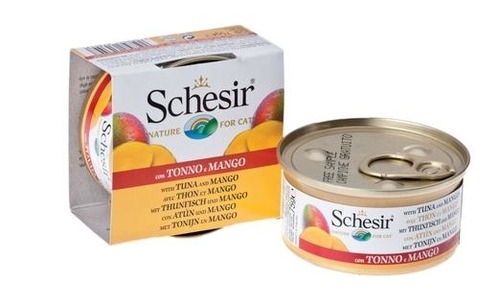 Schesir Fruit is a supplementary feed for adult cats! COMPOSITION: Tuna 45,7%, mango 4%, rice 4%. ANALYTICAL CONSTITUENTS AND Kcal/Kg: Protein 11%, crude oils and fats 0,2%, crude fibre 0,1%, crude ash 1,5%, moisture 84%.